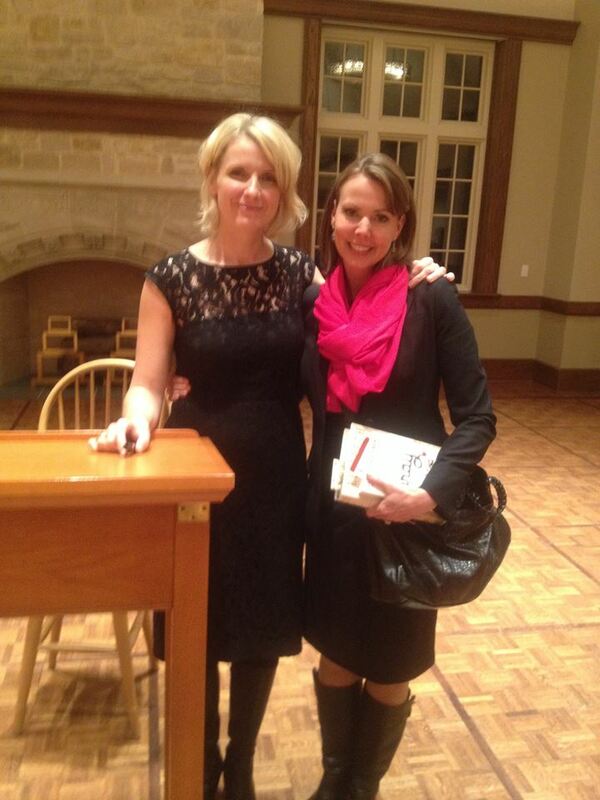 Tonight I met Elizabeth Gilbert, author or Eat Pray Love and I’m ashamed to admit I was more than a little star struck. Being an actor, working in the public eye and meeting my fair share of celebrities, I don’t normally get star struck or go out of my way to meet famous people. But tonight I drove an hour in the rain through terrible traffic to hear Liz Gilbert speak and have her sign my copy of Eat Pray Love and her new book The Signature of All Things. I was the first person to have my booked signed and it was such an emotional moment for me to meet the woman whose writing had not only given me hope that I could be happy but possibly saved my life. It was through her book that I had the determination to practice Siddha yoga, to pray for a miracle and to have the courage to leave Perth in search of happiness here in America. So the moment I handed her my book with the picture of Gurumai and my Qantas boarding pass as bookmarks and explained (while fumbling, stuttering and not being able to think because I have such a huge girl crush) was quite tear filled. She was gracious and lovely and gave me a hug. Later I snuck back into the reception to try and speak to her again (ok, maybe that was a little weird but she is SO AMAZING….hopefully she doesn’t think I’m a stalker). She asked me how it was going since I came over here and I now realize I haven’t been fully authentic about my experience lately. The depression and negativity have returned. I’ve found myself brooding and nasty again. Of course, I didn’t want to tell her that so I just mumbled something about being in love with a wonderful man and she said, “Happy happy”. But the truth is I’m not happy. Well, happier than I was in Australia but not as happy as I have been. I don’t know if it’s because I tried to come off the Prozac or because I need to be doing something new every six months (and my six months of newness on my acting career in Dallas is up). So, my depression has returned. The newness of Dallas has worn off, the newness of Tim has worn off and the newness of acting in Dallas has worn off. What should I do now? Elizabeth Gilbert says that happiness is hard won. What do I have to do for my happiness now? I got to ask her if she still practices Siddha yoga and the answer she gave was perfect. She said her creativity, her writing is her spiritual devotion. There are so many similarities between creativity and spirituality and that she took a vow of devotion to writing. That’s kind of where I’m at. After so many years of devoted spiritual practice, my acting is now my devotion. And I think that’s why I turned down the opportunity to go to the ashram. My ashram is here, in the casting offices of Dallas.